The rushing game is slowly disappearing. When it doubt, chunk the pigskin. 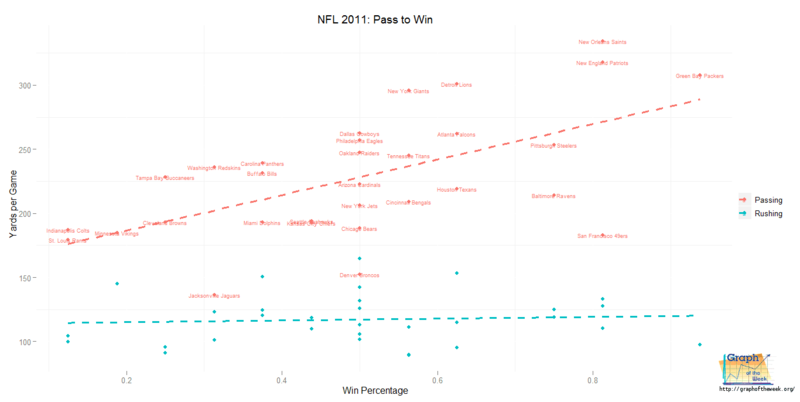 Whether you like it or not, NFL (National Football League) teams are relying upon passing more and more. Looking at the above chart, the average passing yards per game tends to go up by 25 yards every two decades – or 1.25 yards per year. As the game has progressed, rule changes (especially since 1974) have allowed receivers nearly unrestricted movement down field. The result? A wide receiver can basically sprint thirty or forty yards, ‘juking‘ defenders without being touched. The ball can then be rocketed to them in no time resulting in huge gains – given you have a great quarterback. In other words, if you don’t have the ball in your hands, you are allowed free movement at full speed. Try doing that with the ball in your hands – you will be gang tackled. 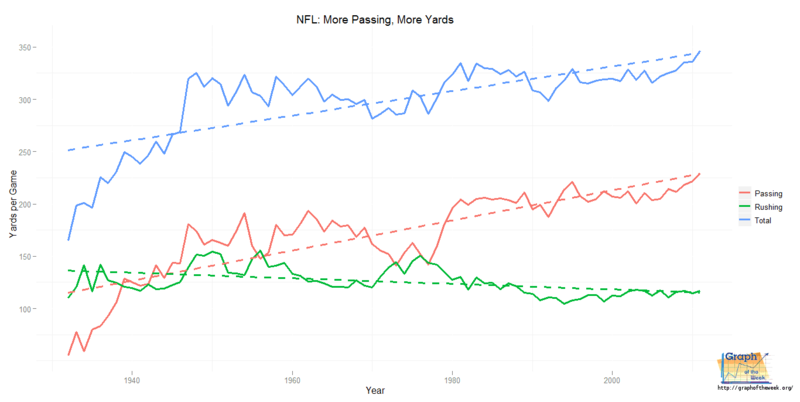 Which is one reason why rushing is slowly losing favor and trending downward slightly each year (0.3 yards per year). And also why rushers have the shortest NFL careers – they get hit relentlessly and often. So why rush at all? Time. It keeps the clock running which keeps the other team’s offense off the field. Not to mention giving the offense a chance to beat up the defense a little. There are several other reasons to run the ball, but this is not a football primer, so we’ll stop there. In 2011, there was a relationship between passing and winning. How much of a relationship? Well, about 33% of a team’s winning percentage can be attributed to its passing yardage total. Admittedly, that’s not a very strong relationship, but teams should pay attention to it regardless. Look at the graph below to see the trend as well as the teams employing it more effectively. There is a financial scrum every time a good quarterback hits the market which is a rare phenomenon in and of itself. Teams which understand how important the passing game is will go to extreme measures to obtain the right QB (see Peyton Manning). Having the ability to read the defense, react accordingly, understand the passing routes and deliver a crisp pass to the receiver are sought-after qualities leading to a significant number of wins. Perhaps the more surprising statistic is that rushing has no relationship to winning in terms of yardage. That being said, it is likely that rushing helps to open up the passing game. If the defense knows you can run, then they have to ‘play honest’ (prevents them from setting up only to defend the pass). Regardless, there is no doubt that rushing for 200 yards per game will not get you wins as there is no correlation. The NFL has changed the rules over time to protect the offense – especially the quarterback and receivers. Therefore, if you have premium players capable of exploiting the niches made available via these rule changes, then you most likely have yourself a winning team. Additionally, the fans seem to love a ‘wide open’ style of play which involves lots of passing. On the other hand, nothing is more deflating than seeing a team run it up the middle for no gain. Expect to see more passing as the game evolves unless the rules change in favor of rushing. Next year this author is going to use data such as this to make a few predictions. It shouldn’t be difficult to out-perform the ESPN analysts. 1) Just how little can a team rush the ball and still be competitive? 2) Will we see a team average 400 yards passing per game in the future? 3) Will the NFL change the rules to make rushing more viable (again)?